I have been spending entirely too much time today with the lovely dataset from the Maine Municipal Association’s most recent Fiscal Survey Report. This report provides the basic budget categories for the most common categories of expense across 218 Maine municipalities. That’s 45% of the municipalities in Maine, so it gives you a very good profile of the state’s local revenues and expenditures. Portland and Bangor apparently did not return their surveys, so are unfortunately not part of the list. C’est la vie. On the positive side, it gives Lewiston (our second largest municipality! How do I always forget this? ), Auburn, Sanford and Biddeford an unusual opportunity to represent as members of Maine’s cohort of larger towns. The survey divides towns into categories based on sizes. For anyone thinking about municipal size categories outside of Maine, you’ll have to trust us (that’s me and MMA) – multiple sub-10,000 size categories are meaningful and relate to real differences in amenities, services, and atmosphere. 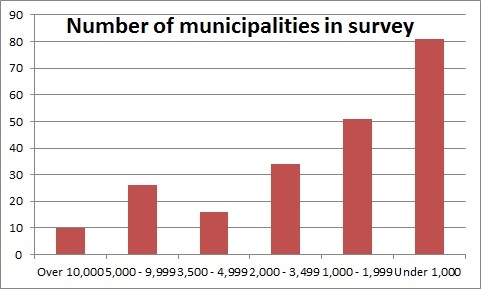 Around 50% of each Maine municipal size-category responded to the survey, so the distribution of the survey population pretty closely matches the distribution of actual municipal sizes in Maine — with the exception that the smallest size category, the sub-1000 size, is actually underrepresented even though it is already the largest category in terms of respondents. There are many, many very tiny towns in Maine. Nearly half of all Maine towns have fewer than 1,000 people. So is this a problem? When we think of small Maine towns, we often think some pretty positive things: cute, homespun, Norman Rockwell-esque downtowns, perhaps with a neighborhood cat sauntering confidently across a quiet Main Street, traditional bean suppers. Depending on our frame of mind, we may think some negative things about these places as well: outdated, Norman Bates-ish pass-throughs on the way to somewhere else, uncontrolled feral cats, traditional bean suppers. Both of these images have their place, and the answer to the question of which is true depends on who’s looking. The question that we can answer somewhat more definitively, given the MMA data, is whether these smaller places are cost-efficient. In most of our direct purchasing, we have the experience that higher volume brings lower per-unit costs. Buy the big box of cereal and you will pay much less per serving than if you buy lots of those little single-breakfast boxes. It would seem logical that this principle would continue to hold in municipalities. Surely there must be economies of scale in municipal purchasing, just as there is in personal purchasing. In municipalities, too, you would expect town offices in larger towns to be able to realize greater service efficiencies, since each job that a town employee does affects a larger number of people. So is this the case? Here’s the story with property tax. For all municipalities I found the per-capita property tax collection by dividing each town’s total property tax by its number of residents. I then found the median per capita property tax for each of the municipal size groups and reported these numbers above. Among towns ranging from 1,000 residents to over 10,000 residents, smaller towns collect significantly less per capita property tax. This may mean that the combination of mill rates and home values in larger towns produces larger residential property tax bills; on the other hand, because the MMA survey doesn’t break out residential and business taxpayers, maybe the higher business density of larger towns accounts for that difference. But what is going on with the high levels of per capita property tax collection in the tiny towns? 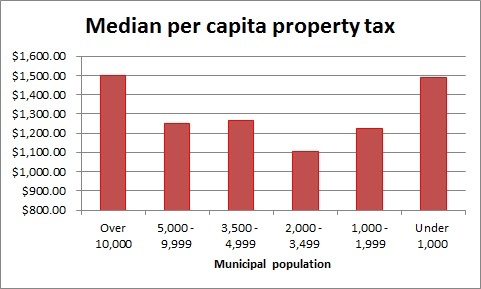 The tiny category (<1000) also demonstrated by far the greatest variation in per capita property tax collection. This amount ranged from a low of $104 per-resident average property tax collection in Garfield Plantation to an average of $8794 per resident property tax collection in North Haven. Are the residents of North Haven really each paying an average of almost $9000 in property tax? Probably not. The data from many tiny towns are quite skewed because a number of tiny towns are popular locations for remote vacation homes. Swan’s Island and Newry are two more tiny towns with high per resident property tax, but these are locations where many people will pay to maintain a cabin or condo but not actually reside. On the other hand, there are also plenty of tiny towns which are not vacation destinations, and where the residents probably are the ones actually paying all the property taxes. From the larger towns, however, the data seem more regularly dispersed. What explains the difference in per-capita property tax rates? As it turns out, expenditures! I know you sit here now on tenterhooks awaiting the resolution of this tale of 218 budgets, but like Scheherazade said, always leave them wanting more…tomorrow, tune in for the exciting denouement of “Analyzing the MMA 2011 Fiscal Survey,” featuring a detailed review of those very expenditures. Will the culprit be general administration? Public safety? Public works and human services? Tune in and find out! This entry was posted in Municipal Finance. Bookmark the permalink.